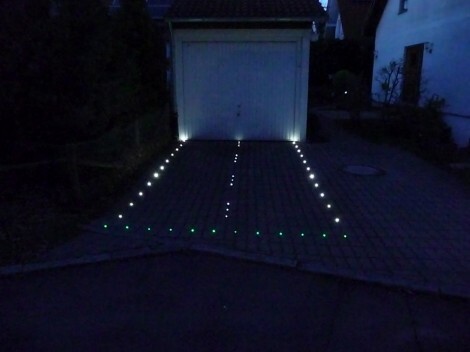 [Timo] didn’t want to look like every other lighted driveway but using solar path lights. Instead he decided to light it up as if it were a runway. It’s easy to look at the result as cute and move on to the next hack. But look again. If you were going to do this yourself how would you implement it considering a car will drive over it, and it’s outdoors? The first issue of protecting this from traffic is actually not too tough in this case. [Timo’s] driveway is made of pavers and is not a solid sheet of asphalt or concrete. He drilled out some of the intersections to make just enough room for each of the PCBs he etched to house the LEDs and host the driver. These boards are inserted horizontally into the sand between the pavers like a fin, with the surface mount LED positioned along the edge. Power and control wires run along each line of lights. They are serial controlled which cuts down on the number of conductors needed. [Timo] didn’t mention weather proofing but we’d suggest casting them in crystal clear resin just like this headphone amplifier. Here’s an idea that may take less effort though: Use projected light of some sort from the top of the garage. Configure it so even though the image is slanted the projection ends up lining up. Seems easier to protect and configure. How about keep the lights indoors and run fiber optic cables out. I have even seen them inbeded in concrete. Flashy, time-consuming, and not terribly practical. In other words, I LOVE IT! Very well done! What? It would be totally awesome if a plane ended up in his garage!! Insurance claims aside, I’d build one of those fully featured flight sims out of it. This is awesome. This would put a smile on my face every evening as I manoeuvre into the hanger. Love it. Being able to do random cool projects like these is one of few reasons I wish I owned a house instead of renting an apartment. From the grader ditch to my shop it’s about 200 feet or so, in the event’s I can continue living here I’s like to do this in some fashion. Not sure how I’d go about it to accommodate blading off snow. The drive is packed rock, often the blade can dig in. During Christmas my neighbors put light strings along the fences next to their drive. From afar is gives a similar look. To read the blog I had to turn off page style so I could use the scroll bar. Might be a good idea for blog spot users to default to classic if they can, I noted clicking on classic on the blogs menu bar moves to stuff covering the browser scroll bar out of the way,without defeating their function. Shouldn’t that be vertically? Or are the boards horizontal under the pavers, with the LED sticking up in the gap between pavers? I wondered this too, since I know the meaning of the word ‘horizontally’. Editors, please actually *read* what you write before posting. Thanks. This is why, despite the daily scratches on my bumper I haven’t done it yet. Soldering smd components isn’t hard, it just takes practice. Use some scrapped boards to practice removal/placement, and fine solder and a sharp tip on your iron. As for weatherproofing, at work we use two-part clear epoxy, then conformal coat the board. It would probably be easier just to but weatherpack connectors on the boards, and after you test them, epoxy the whole thing. To activate ODALS when ATCT is closed after sunset you click the PTT button on your radio tuned to CTAF and they light up for about 15 minutes. Glide-path home, I love it. All the casting resin in the world won’t stand up to rain (we need some) and the massive assault of freeze-thaw-refreeze in those confined spaces. Fiber optic may be the way to go, with thick cladding. I have thought of set in concrete lighting for my drive, mainly address, lat-long, maidenhead block, planet etc. No,just address in binary (428)! Any ideas for layout? Get someone to route out some thick chinks of plexi and then epoxy them into the slots made. And realize that you will have to replace modules every year if you live where winter freezes and has a lot of snow. Otherwise, the same as above, but have bricks routed out for the module and then epoxy the whole thing. that way you have the protection of a whole brick. Somehow it reminded me of this one. Cool project thought! Randy Elwin has added details to Rabbid Animated Clock.